Ivy is just a girl living in Vancouver. This blog is a new project of hers as she rekindled her love for web design. She is passionate for many things and sometimes too many things at once. She graduated with a Bachelor of Arts, majoring in Geography (Urban Studies) with a minor in History at Simon Fraser University. She also went to British Columbia Institute of Technology and received a Computer Systems Technology diploma (and won the Dean’s Award!). She is also looking for an opportunity to use the skills she acquired for her studies and job on something new. 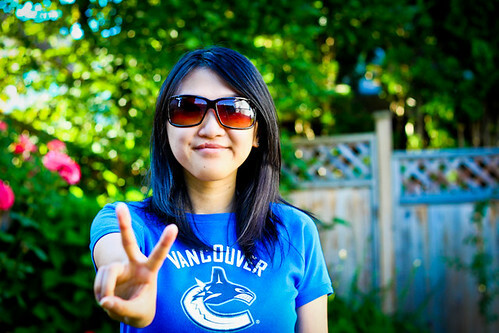 She’s an avid Vancouver Canucks fan and the only hockey team she will forever cheer for. She also watches baseball – Toronto Blue Jays and Oakland Athletics, and basketball – Dallas Mavericks. She spends whatever time she has left watching these sporting events. She is also an avid TV watcher and photographer. She watches way too many TV shows for her own good and there are too many to list out. Some of her favourites are: Doctor Who, Bones, Castle, How I Met Your Mother, Archer, The Daily Show, and The Colbert Report. (Other off-aired ones are: Arrested Development, Veronica Mars, Buffy the Vampire Slayer, LOST, Fringe, etc.). Nowadays, she only watches Archer from that list and marathons Korean Drama. You can find her photos on her Flickr page. She also tweets. You can contact her with the following form. She will get back to you as soon as she can.